(Trent Nelson | The Salt Lake Tribune) Utah Utes running back Zack Moss (2) as the Utah Utes host the USC Trojans, NCAA football at Rice-Eccles Stadium in Salt Lake City, Saturday Oct. 20, 2018. Utah running back Zack Moss' knee injury enabled his former backup to produce one of the team's biggest rushing days of the season Saturday, adding another twist to the Utes' adventurous football season. There's more to tell about what happened to Moss, whose injury came in what Ute coach Kyle Whittingham labeled a “very strange” way. After his team’s 32-25 win over Oregon, Whittingham clarified that Moss' midweek injury occurred away from the practice field — contrary to various media reports, including The Salt Lake Tribune’s account. In any case, as Moss was climbing into bed, his knee “locked up on him,” Whittingham said. Moss had rushed for 1,092 yards in nine games and was on track to break Utah's season and career records as a junior. His injury followed Ute quarterback Tyler Huntley, Moss' high school teammate in Florida, being sidelined by a broken collarbone last weekend at Arizona State. Ute receiver Demari Simpkins, the only active of member of the Hallandale Trio, caught two passes for 30 yards Saturday. Filling in for Moss, Ute junior Armand Shyne rushed for 174 yards on 26 carries against Oregon. 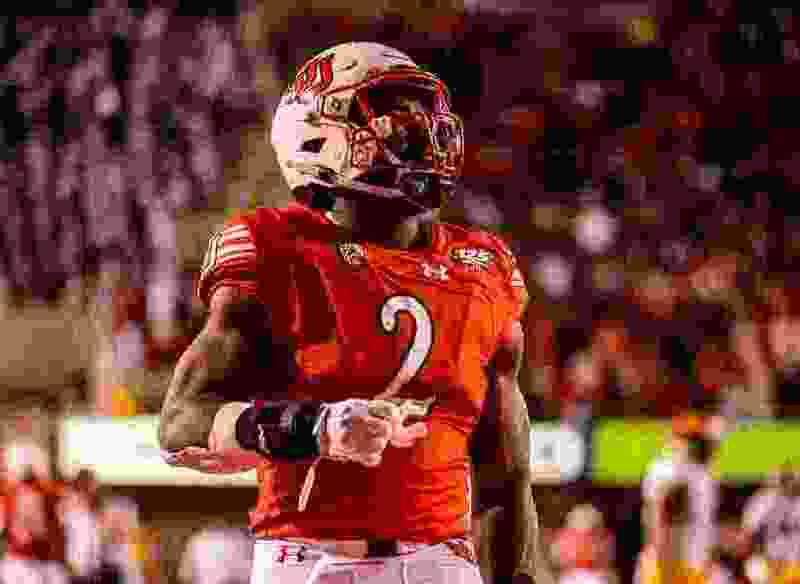 Whittingham said Moss is seeking a second opinion regarding possible surgery and acknowledged Moss may have played his last game for the Utes, considering his NFL potential. Utah used freshman Devin Brumfield for two carries and redshirt freshman TJ Green for one run in relief of Shyne. A direct snap that went over Brumfield's head cost the Utes a chance to score a touchdown in the second quarter. Brumfield appeared in his third game of the season; he could play once more and still preserve a redshirt year, according to new NCAA rules. The Utes (7-3, 5-3 Pac-12) will conclude conference play next Saturday at Colorado, then host BYU in the regular-season finale. They may qualify for the Pac-12 championship game the following week, and are assured of a bowl appearance.